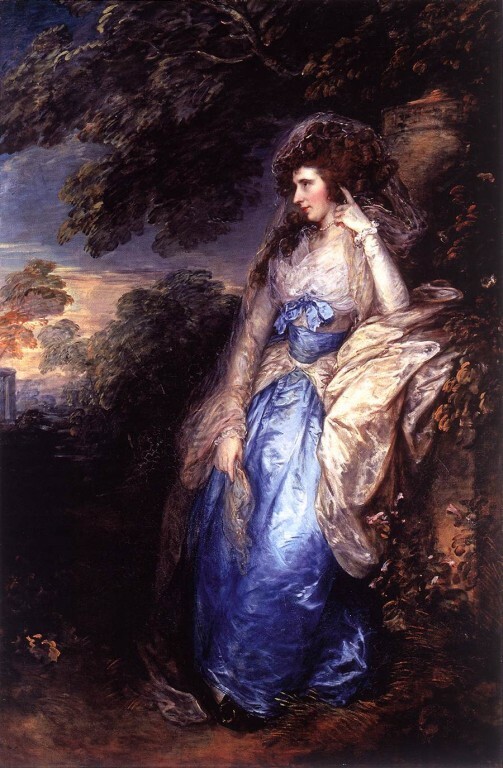 Gainsborough was a poetic painter, Keats the most painterly of poets in an age inspired by unbounded imaginative affinities. Keats’ liquid imagery was as often in danger of dripping from his verse as Gainsborough’s oil-diluted colours from his palette. They were both attracted to contrasts of the tenderness of “embalmed darkness” and the “silvery splendour” of light; “the depths of twilight and the dews and pearls of the morning” that John Constable identified as the essence of Gainsborough’s landscape. 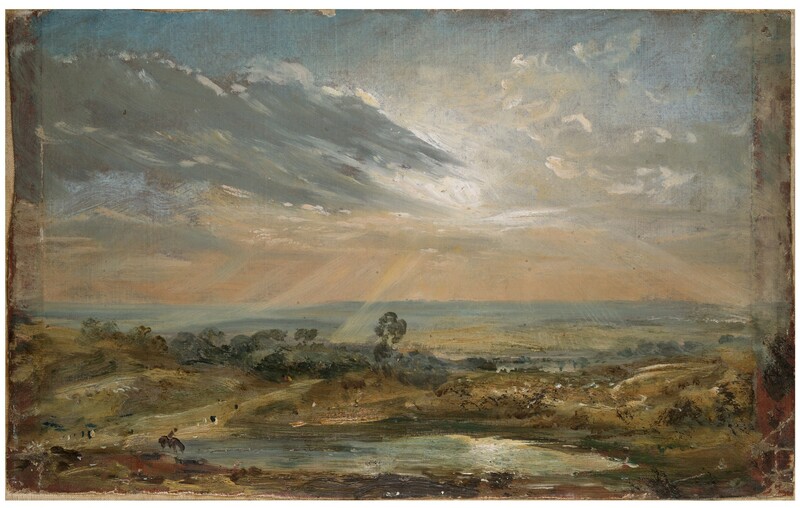 In one of his Hampstead lectures, Constable declared: “chiarascuro, colour, and composition, are all poetic qualities”. Keats composed To Autumn after seeing a rosy-hued stubble plain looking “warm – in the same way that some pictures look warm”. Constable recognized his own joyful identification with nature in the emotions of Milton’s Adam, “his eyes opening for the first time on the wonders of the animate and inanimate world”,  the same fragrant, smiling landscape in Paradise Lost where the spiritual passage of waking to find “all real, as the dream” struck Keats as analogous to the “Imagination and its empyreal reflection”. A Hayfield near East Bergholt at Sunset by John Constable. Oil on paper. © Victoria and Albert Museum, London. In Constable’s paintings, the transition from objective description to personal declaration of feeling is imperceptible; his ego is nowhere to be found. He has the quality which Keats called “Negative Capability”. He saw a chain of art, as Keats saw the march of Intellect, minds that “leave other in contrary directions, traverse each other in Numberless points, and [at] last greet each other at the Journeys end”. Constable advised young painters to study old masters – no great painter could have existed without them – but not to imitate them, which produces mannerism. “When I sit down to make a sketch from nature, the first thing I try to do is, to forget I have ever seen a picture”. Claude’s Seaport with the Embarkation of Saint Ursula, oil on canvas, 1641. National Gallery London. Constable’s process recalls Keats’ training of himself in poetry, shedding imitations while still learning from great poets, all the while trying to be passive and receptive on the “voyage of conception”, the flower, not the bee, producing works of art that leave the reader or viewer in the “Luxury of twilight”, with the feeling of remembered experiences, their “own highest thoughts”. 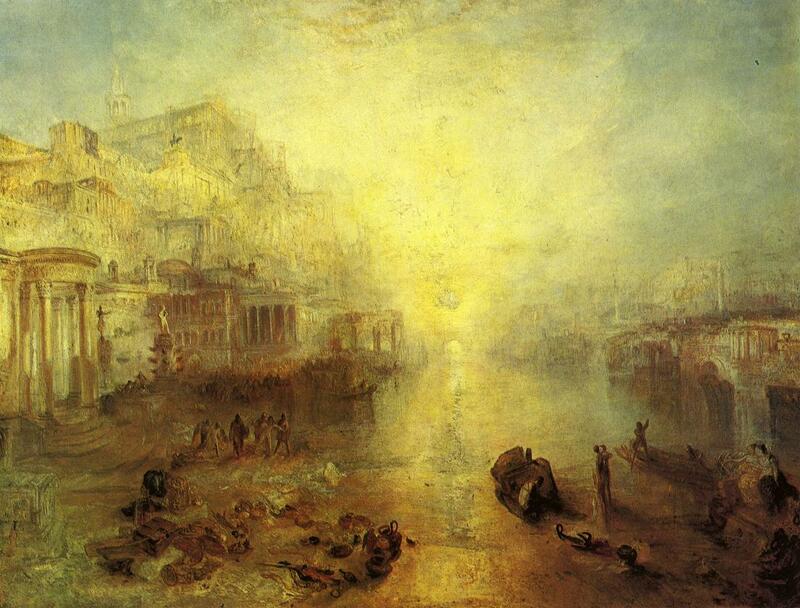 Turner’s Ovid Banished from Rome, 1838. The Athenaeum. Keats, Ode to a Nightingale. Constable describing Gainsborough’s landscape, C.R. Leslie, Memoirs of the Life of John Constable, Composed Chiefly of His Letters (1843), Phaidon, London, 1951, p322. This entry was posted in Art History, Baroque, Claude, John Constable, John Keats, Poetry of Art, Rococo, Romanticism, Thomas Gainsborough and tagged Art, Baroque, Fantasy, Gardens, History, John Keats, paintings, Portraits, Rijksmuseum Amsterdam, Rococo, The Character of Light. What an amazing post. And thanks to First Night Design for the reblog. An interesting post. Well done. I think of Keats’ autumn walk at this time of year and the marvelous poem that resulted from it. That’s exactly what I kept doing. Got to agree with Sarah, a fascinating idea. That blue dress is indeed startling. I keep scrolling back up, to admire the colour.